The Cal volleyball team has added two accomplished student-athletes to the program, interim head coach Jennifer Dorr announced Tuesday. 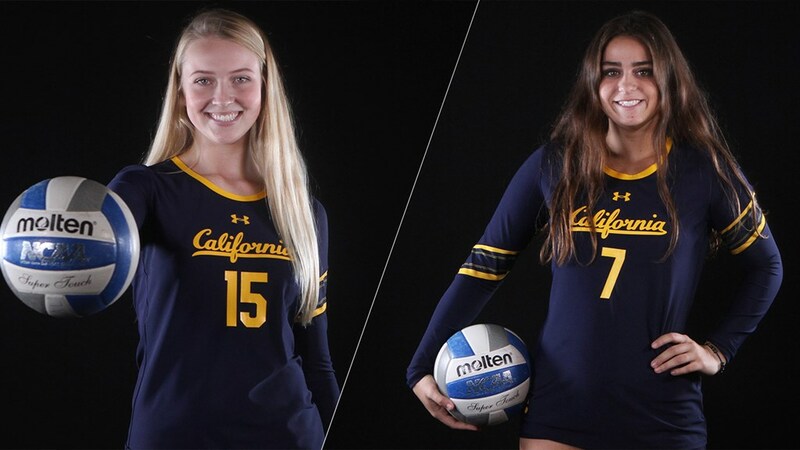 Bella Bergmark, a 6-foot-2 middle blocker from Larkspur, Calif, and Gabby Bellizzi, a 5-6 libero from Ladera Ranch, Calif., have each submitted a Statement of Intent to Register and will join the Golden Bears program in the fall. Bergmark led Marin Catholic High School to back-to-back North Coast Section championships and is a two-time All-Marin County Athletic League selection. She also was named to the honor roll all four years of high school. Bellizzi is a three-time All-South Coast League pick who helped San Juan Hills High School reach the CIF Southern California Division I championship match as a senior. She was also a member of the National Honors Society. The Bears are currently going through spring workouts and will play three scrimmages in April, beginning at UC Davis on April 14.